Regardless of the fact that I tried unsuccessfully to get my husband to agree to steak this year instead of turkey (who's with me? ), I've come to really love Thanksgiving. I'm going to chalk it up to the fact that I'm definitely more mature and grateful 😉. Really I'm sure it's just that sitting at at a table with people I love, talking, and eating for hours has become more fun as I've grown older and more gluttonous. That's the sign of maturity, right? Seriously though, I'd really love my kids to feel the spirit of gratitude behind Thanksgiving. Gratitude bring contentment, and contentment is such.a treasure. So. In the spirit of being grateful and having grateful kids, here are three Thanksgiving picture books you (probably) haven't heard of. I've personally read each of these many times and liked them so much I wanted to tell you about them. This is my favorite book of the three. It's great because it focuses on being grateful and making the best of any situation and isn't so much about the Thanksgiving food. Also I have boys, so anything with a ball is an instant hit with them. My family has really never watched or played football on Thanksgiving, although I know it's huge for lots of people. I'd definitely be down with initiating a family turkey bowl identical to the one in the book. Also, the illustrations are so great. They really make me feel like I'm one of those kids out there on the field. Another book where people make the best of a Thanksgiving that goes awry. All the mishaps in this book made me laugh. Although they only serve four dishes at their Thanksgiving dinner, and I gotta admit, that seems a little stingy..
And two I haven't read (yet) but am planning on very soon. 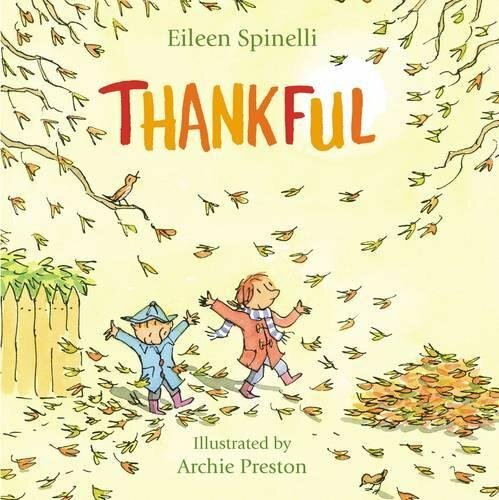 Thankful by Eileen Spinelli (you'll notice she also wrote Thanksgiving at the Tappleton's. Two Thanksgiving Picture books? My kinda lady). 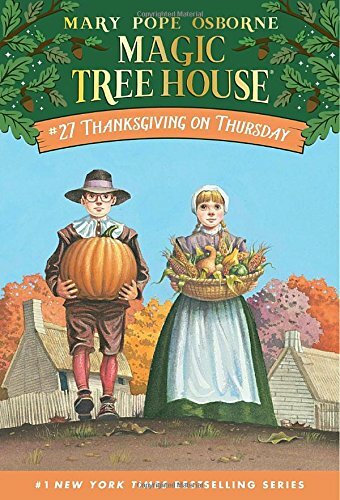 My son has also just gotten into audio books so I'm going to download Thanksgiving on Thursday by Mary Pope Osborne for him on audio. Happy reading and happppppy eating! All Amazon links are affiliate links. Also I made you this image below for Pinterest. 😊 If you save or share it, it would make my day.